Thanks to dedicated bloggers, bakers, and chefs, vegan baking is no longer shrouded in mystery. With vegan blogs, cookbooks, and restaurants, anybody can try out vegan food, including vegan cookies. Many cookie recipes are surprisingly easy to veganize. Usually it's a matter of swapping non-dairy milk for cow's milk and substituting ingredients such as soy yogurt, flaxseed, or egg replacements for eggs. After seeing so many wonderful vegan cookies in Seasons One and Two of Eat Christmas Cookies, I was inspired to make some myself. I adapted a recipe called Spiced Oats and Date Cookies from Sunita of the beautiful blog, Sunita's World. Sunita's original recipe called for whole milk, but I substituted vanilla soy milk, added some orange juice and zest, and called them Vegan Chewy Orange, Date, and Oatmeal Cookies. 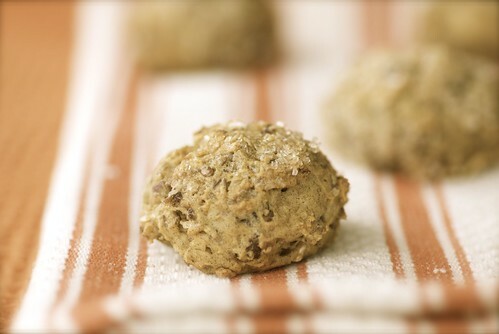 These vegan cookies are packed with healthy ingredients, such as dates, oats, whole wheat flour, and flax seed, yet they're satisfyingly sweet and chewy. Vegans and non-vegans alike will love them. Now, it's time for the give-away! I told you Santa would be giving away prizes during our Eat Christmas Cookies Event, and the next one is a copy of Vegan Cookies Invade Your Cookie Jar by Isa Chandra Moskowitz & Terry Hope Romero. This delightful little book is chock-full of over 100 mouth-watering vegan cookie recipes, including Caramel Pecan Bars, Chocolate Chip Cream Cheese Brownies, and Macadamia Lace Cookies. In addition to delicious recipes, the authors provide tips and tricks for successful vegan baking. So if you've got a vegan on your Christmas list, this is the perfect gift. One winner will be randomly selected from the ongoing Christmas Cookie round-up on Monday, December 14th. So send in your cookie for a chance to win. Don't forget to enter for the Fresh & Easy give-away too. One lucky Food Blogga reader will receive a gift from Fresh & Easy containing a bottle of wine in a reusable tote bag, a box of chocolates, and coupons for future purchases. For details, please see this Fresh & Easy post. Good luck! I made the cookies vegan by substituting vanilla soy milk for whole milk, but either works. I made my cookies with soft, fresh Medjool dates, which are currently in season, but you can substitute dried dates. However, if they're really hard, I'd suggest soaking them in some warm orange juice or water for 20-30 minutes prior to baking. The texture of these cookies is similar to a biscuit with a crusty exterior yet soft, chewy interior. 1. Center a rack in the oven and preheat to 350 degrees F. Line a large baking sheet with parchment paper. 2. Place dates,milk, oil, orange juice, and orange zest in a processor or blender. Process until dates are broken down into tiny pieces. 3. In a large bowl, stir oats, wheat flour, baking soda, ginger, cinnamon, and flax seeds. Make a well in the center of the mixture. Pour the date mixture into the well, and using your fingertips, lightly combine until a ball forms. Cover with Saran Wrap, and chill in the fridge for 1 hour. 4. In a small bowl, add about 3-4 tablespoons crystallized sugar. You may need more. 5. Using a cookie scoop or spoons, form cookies into approximately 1-inch balls. Drop in the sugar and roll until coated. Place two inches apart on prepared cookie sheet. Bake for 12-15 minutes, or until lightly browned on the outside, but still soft to the touch. Transfer to a cookie rack. Cool completely before storing in an air-tight container. Love the vegan version. Looks beautiful. These sound fantastic with the dates! Really just a great mix of flavors and textures. Great cookies! A wonderful idea! I'll be honest, I've never had vegan cookies/cakes before. I guess the soy milk substitution changes the flavor a little bit. Does the texture change at all? What a great way to make a vegan happy! I'm not a vegan, or even a vegetarian, but I've always incorporated meatless meals into my diet. This would be a great addition to my cookbook repertoire for my New Years resolutions to continue on my journey for healthy eating. I am so going to make a gluten-free version of these. They sound so delicious. Wow, those look so pretty! I'm not vegan, but sometimes I experiment with vegan baked goods and these are one cookie that actually looks better than a non-vegan variety! I am vegan and vegan baking works so well here at a higher elevation. I can't wait to try those cookies. These little cookies are lovely--dates and orange are flavors that go so well together. what an interesting recipe, look delicious! and vegan too !! Y.U.M! I love your description of the texture and they look good, too. Could I possibly fit in another cookie bake this week? Positively. seaon-Honestly, I made them both ways and couldn't tell the difference. suzan-That sounds like a wonderful idea. I hope you try them. tastyeatsathome-Please let me know if you do! sues-I think I'll be experimenting more too. karyn-I didn't know that. I hope you try them then. alexa-I think they're naturals together. Wow - those look great! I need to buy some dates and make these. My daughter is experimenting with vegan eating so I'd love to make these for her. Thank you! I'm totally forwarding this to a vegan friend of mine who will LOVE it. Yum...I want those cookies...NOW! haha!